Setting off from Port Hardy the next day in our final hire car, we made the spectacular drive down Highway 19, on the first leg of our journey down to Vancouver. Whilst most travellers would continue down the 19 to Nanaimo and take the shuttle to Horseshoe Bay, we had decided to go the long � and scenic � route, via Powell River, which would involve three separate ferry crossings. 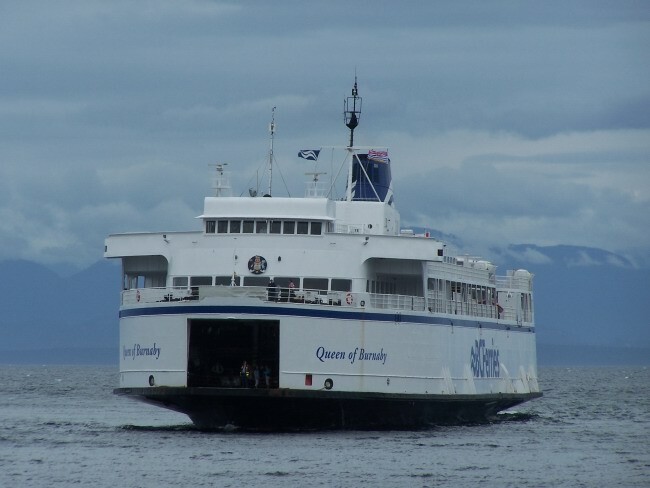 Firstly, however, upon reaching Campbell River at approximately 11:00 for a late breakfast stop, we discovered there was time for a quick round trip to Quadra Island, on the 1965-built Powell River Queen. Similar in appearance to Wightlink�s C-class, the Powell River Queen offers a single open-plan saloon, comprising bench-type seating. A one-time cafeteria servery is now out of use, and catering is restricted to vending machines. The interior is rather drab, and whilst clean, would certainly benefit from refurbishment. 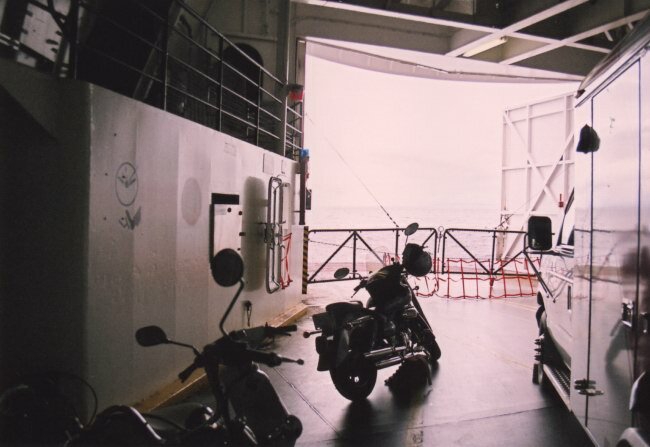 The first of the three crossings designed to take us to Vancouver was the Comox to Powell River route, the most Northerly, and quietest, direct crossing between Vancouver Island and the mainland. Long the final outpost for elderly tonnage, the crossing is now in the hands of the 1965-built Queen of Burnaby, the final member of the V-class. She too was lengthened in 1972, but did not receive the additional car deck and has not benefited from the upgrading that her Swartz Bay-based sisters have. 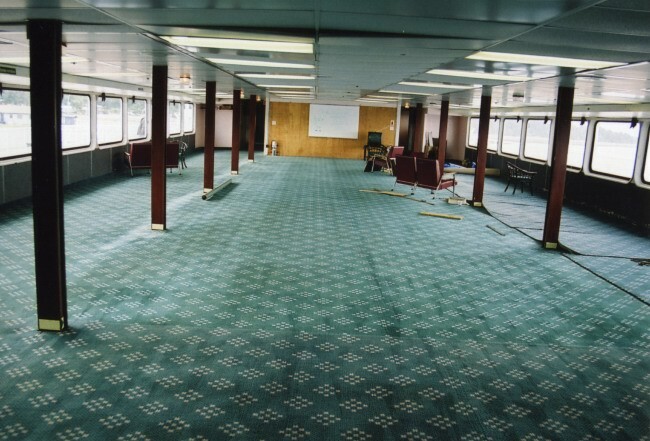 The layout of her passenger accommodation is nonetheless virtually identical to the Queen of Saanich � the main deck commencing forward with an observation lounge, before leading aft into the lounge added in 1972 � this remains in its original state, without the additional coffee bar and shop installed on her sisters. Continuing aft, you pass through a further lounge before reaching the aft cafeteria. 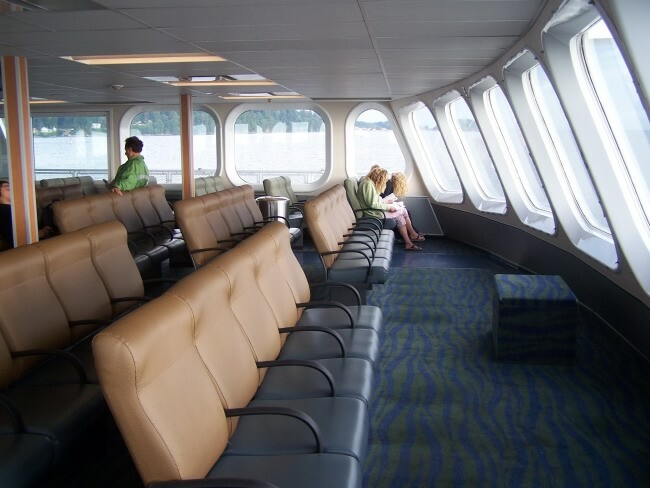 On the Queen of Burnaby, the entire upper deck has been closed to passengers, and the two main saloons, aft and amidships, have been virtually stripped out and are only used for crew recreation. Despite having been laid-over during the crew lunch-break, the Queen of Burnaby departed 15 minutes late, and was unable to catch up time on the 80-minute passage. Intriguingly, the aft car deck doors remained wide open throughout the crossing � which would seem to be standard practice. Upon arrival at Powell River, it became apparent we were not the only passengers taking the scenic route to Vancouver, as a stream of cars turned right with us at the exit to the terminal, and heading South towards Saltery Bay. Despite initial fears of a tight connection, we arrived in plenty of time to see the Queen of Tsawwassen arrive, snapping away as she swung in early evening sunlight before the berth. 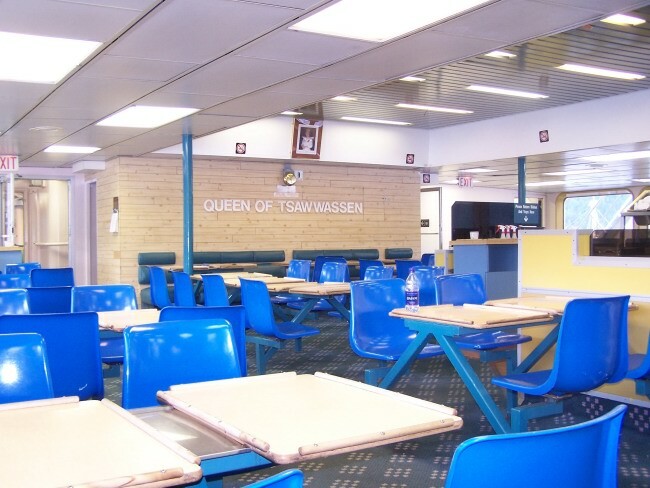 The Queen of Tsawwassen is one of the original BC Ferries ships, delivered in 1960 as the Tsawwassen, along with her sister, the Sidney, which was retired in 2000. The design for the original twins was derived from that of the Coho which we had sampled earlier, and the three ships are highly similar in appearance, dimensions and internal layout. 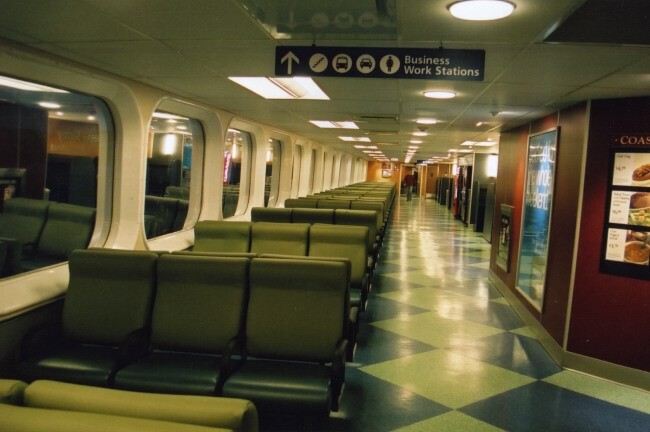 The most significant differences are that the BC Ferries are drive-thorough as opposed to side-loading, and in place of the solarium on the Coho, the Canadian twins have an upper observation lounge. 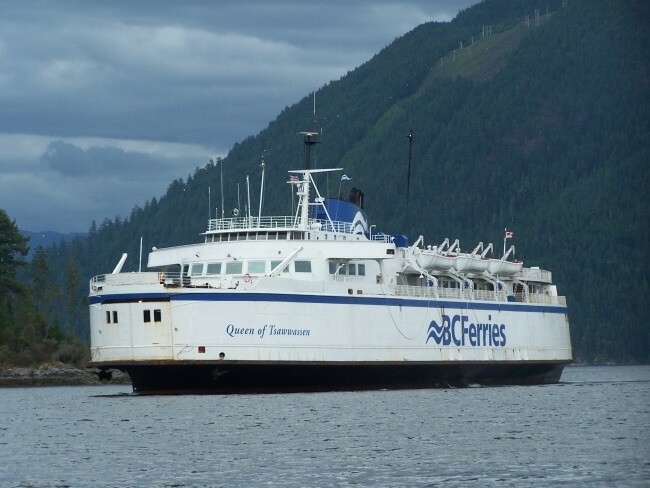 Currently with 46-loyal years� service under her belt, the Queen of Tsawwassen is due for replacement in 2008. Onboard, as with the Coho, facilities comprise a spacious observation lounge forward, leading aft into the forward lobby, and then into the midships seating lounge. The cafeteria is located aft, which was a sterling example of early 1980s refurbishment, with bright yellow Formica panelling and blue plastic seating. 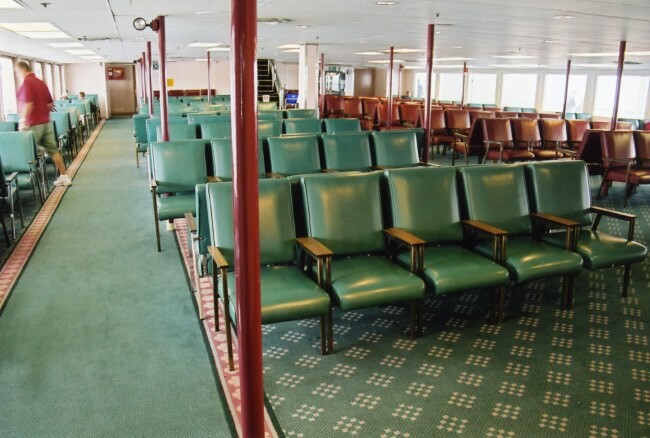 Stairs forward in the midships lounge lead up to the additional observation lounge on the upper deck, which like the other lounges onboard, is finished in the standard BC Ferries style of the 1970s/80s, namely rows of individual seats in green and red soft plastic. The Queen of Tsawwassen was in good condition for her age � although not as immaculately maintained as her half-sister. Sadly the 50-minute crossing passed only too quickly, but even in the fading evening light, the dramatic fjord-like scenery could be appreciated. 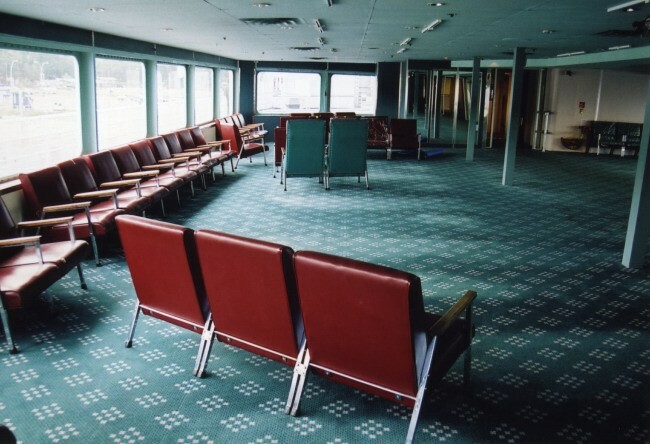 Above and below: The out-of-use and nearly empty pair of upper lounges. Disembarking, we continued South, reaching the port of Langdale in about an hour. There we were booked on the final crossing of the day to Horseshoe Bay. 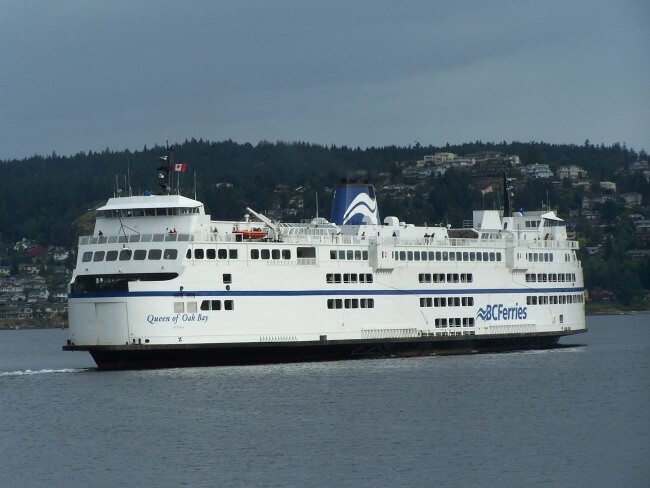 BC Ferries accept reservations only for their major routes � from Horseshoe Bay and Tsawwassen. On all other departures, the services operate on a turn-up and go basis. All vehicle reservations cost an expensive $15 CAD � the full appropriate fares must still be paid at the terminal, but the reservation also guarantees priority boarding through a dedicated lane. At Langdale, the reserve unit Queen of Esquimalt was lying over, and soon our ship, the 1981-built Queen of Surrey, could been seen emerged through the drizzle. Part of the five-strong C-class, the Queen of Surrey had only just re-entered service less than 2 weeks previously after a $35million mid-life refurbishment, the fourth C-class unit to receive such upgrading. Her accommodation is now entirely in the new corporate style. Passenger facilities onboard the C-class� are concentrated on one single deck, unlike the other main classes. The 1981-twins� accommodation is slightly larger than the earlier 1976-built sisters, stretching from stem to stern with only minimal sundeck space on the main passenger deck. True double-enders, it is hard to identify which is their bow and which is their stern! Their open-plan accommodation is slightly larger than the earlier 1976-built sisters, and is linked from one end to the other by twin walkways, one on either beam. Facilities commence at one end with a small observation seating lounge, aft of which is the main Coastal Caf�. 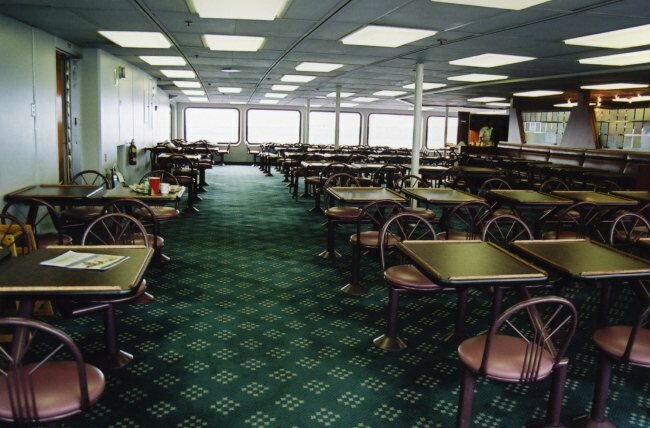 Amidships, there are twin side lounges, one of which is lined inboard with business workstations, the other of which is the location for the information desk. 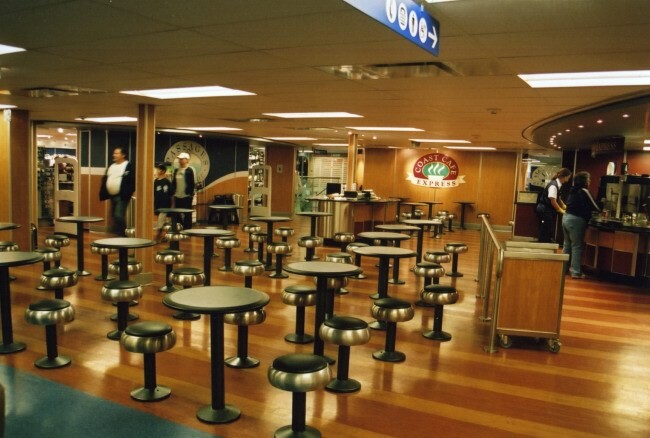 Continuing aft, passengers find the Coast Caf� Express coffee bar, complete with dedicated seating area, opposite of which is the Passages Gift Shop. The walkways then lead past the childrens� play area and information zone to another, identical observation lounge aft. The twins were built with double vehicle decks, the lower containing fixed mezzanines, allowing them to carry up to 360 cars. The Queen of Surrey was slightly delayed in departure, due to the time it took to disgorge an enormous mobile home from her garage, but she had departed again before we even reached her upper decks. The 50-minute crossing sailed past, allowing us just enough time to enjoy a delicious fresh shrimp salad from the Coastal Caf�, or, for one member of the party, a delicious fresh burger. As mentioned, the food onboard the fleet is uniformly excellent. The salads were extremely reasonable at under �4, and came with a wide choice of dressings. The burger was cooked to order, with chunky chips and a drink for a similar price. Above: The Queen of Burnaby's amidships lounge. The last overnight stop on our trip was at Horseshoe Bay, and it was here our party disbanded. One was off to Toronto, one went to spend the morning in Vancouver tracking down the infamous PacifiCats, and one took the car for another round-trip to Vancouver Island. The 06:20 sailing from Horseshoe Bay to Nanaimo, the first departure of the day, already had lanes of traffic queuing when I arrived. However, an advance reservation allowed priority boarding, and soon the car was safely stowed on the Queen of Oak Bay. The Queen of Oak Bay was the third C-class to be refurbished in 2004, and remains in superb condition throughout. Her accommodation is absolutely identical to that on her sister, the Queen of Surrey. The day-light crossing revealed extensive open deck space on Deck 7, including two sheltered solariums. With smoking now banned throughout internal accommodation, these have now become havens for those craving a nicotine hit. Once the initial queues had died down, as usual, an excellent breakfast was enjoyed onboard, with the eggs freshly prepared to order, and before long the Queen of Oak Bay was approaching Nanaimo, pausing briefly at the entrance to allow her running mate, the Queen of Cowichan, to clear. 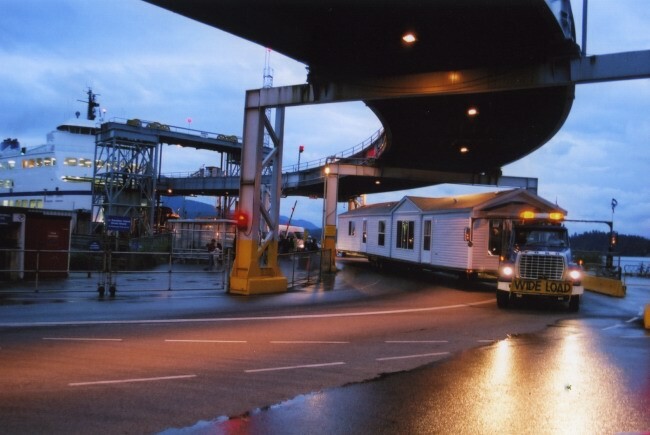 The Horseshoe Bay route sails to Departure Bay at Nanaimo, but since 1997 there have been two Nanaimo terminals, after a brand-new complex having been constructed at Duke Point for the service to Tsawwassen. Driving off the Queen of Oak Bay, I headed South, skirting Nanaimo itself, trying to find Duke Point for the final leg of the trip. Unusually, I found the Duke Point terminal very poorly sign-posted, and with more luck than skill, I eventually arrived to check-in for the 10:00 sailing to Tsawwassen, BC Ferries� longest route to Vancouver Island at 2 hours exactly. 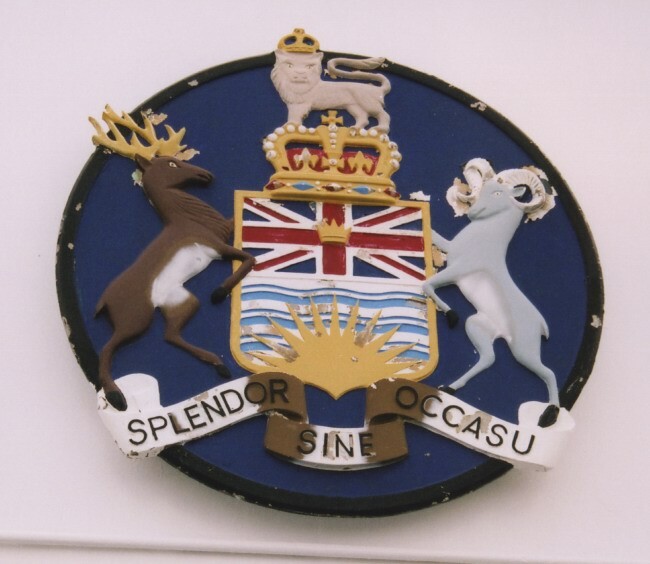 As indicated, this service was operated by the Queen of Alberni, officially the third of the five-strong C-class, but a very much unique vessel. She was built in 1976 to serve principally as a freight, over height vehicle and recreational vehicle carrier, with reduced passenger capacity when compared to the earlier C-class. In 1984 she was lifted to add another vehicle deck, doubling her capacity, and in 1986 her passenger facilities were extended. Today, she offers two large observation lounges, one at each end, which are linked by a side seating lounge to starboard amidships. That aft features a coffee bar, whilst centrally amidships is her cafeteria, with a dedicated seating area, and an overflow seating area incorporated into the forward observation lounge. 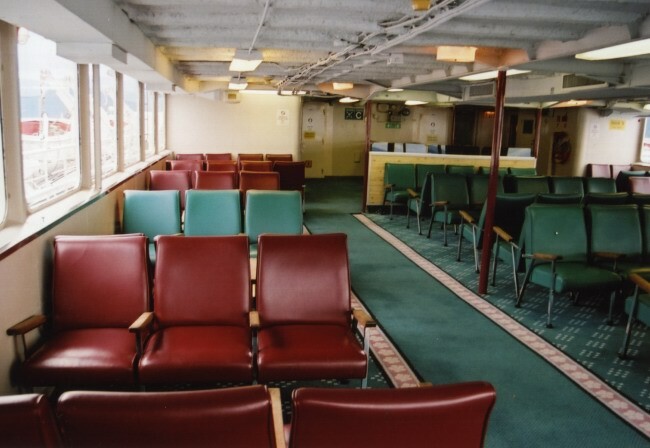 Her interior remains essentially unaltered from the 1986 refit � with row upon row of individual seats in dark red or green - although all will soon change, as she is due to undergo major refurbishment over winter 2006 to upgrade her in line with her sisters. After another enjoyable BC Ferries� meal, there was enough time to relax with a book in one of the observation lounges, before soon Tsawwassen was in sight. Benefiting from the priority reserved loading, I was one of the first cars off, and soon was heading towards Vancouver International Airport, and ultimately, a Thomas Cook flight back to London Gatwick. 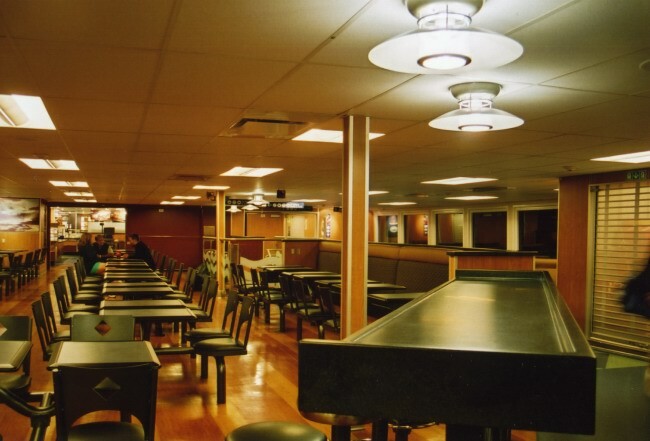 Above: The Queen of Burnaby's enclosed video arcade, a space which served as a shop when the ship was sold and operated as the Royal Victorian and then the Princess Marguerite III between Victoria and Seattle after 1994. 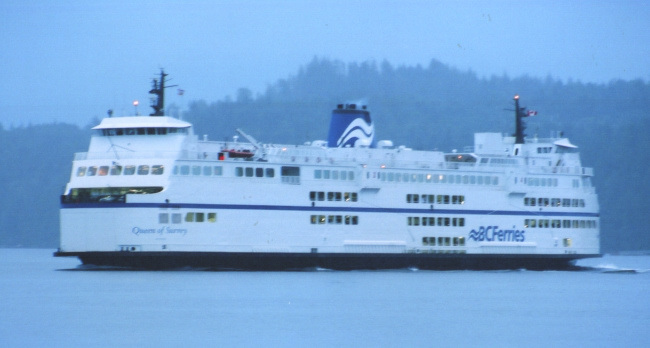 BC Ferries repurchased the ship in 2000 and restored her original name. Above and below: The forward outside deck space, complete with coat of arms. Above: Mid-crossing with the aft door wide open. Above and below: The Queen of Surrey arriving and unloading at Langdale. Above: The Coastal Cafe on the Queen of Surrey. Above: One of the newly-refurbished ship's side lounges. Above: The Coast Cafe Express. Above: The Queen of Oak Bay. Picture Courtesy Richard Seville. 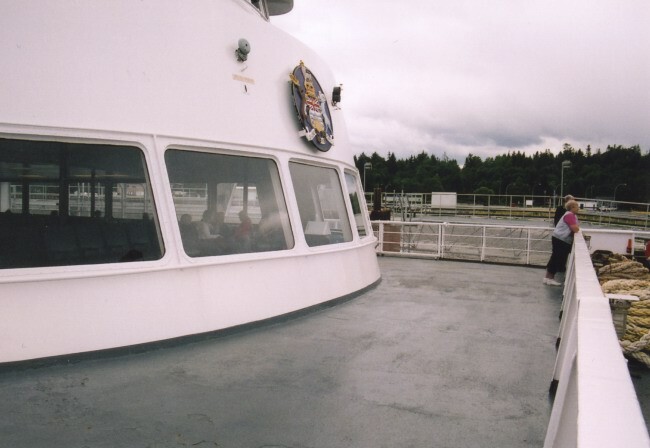 Above: Observation Lounge on the Queen of Oak Bay. Picture Courtesy Richard Seville. Below: Laid up in Vancouver are the three Pacificats. 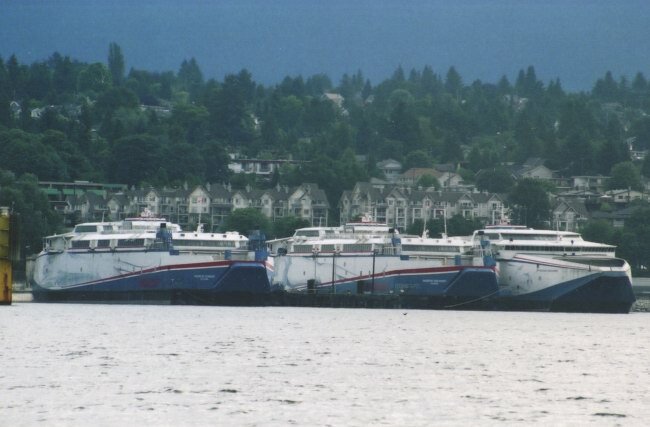 Supposed to be the future of BC Ferries when they were introduced in 1999/2000, they rank, amongst great competition, close to the top of the list of great fast ferry disaster stories. Sharing the same names as Stena's HSS's, the Pacificats 'Explorer', 'Discovery' and 'Voyager' were withdrawn in 2000 - the 'Voyager' never actually entered service. Sold off by the government in 2003, the trio are still awaiting further use.